There are three main things to do in the area, and all of them offer up some jaw-dropping scenery. 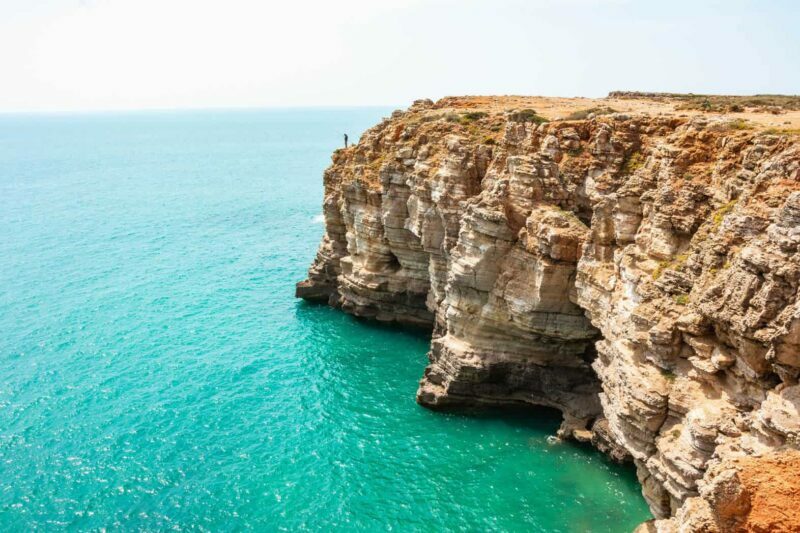 In the Algarve, you spend your time hiking, surfing or beach bumming… The cliffsides are where the hikers are, and just below the cliffs are the beach bums and surfers. What Are the Things to do in The Algarve? Spoiler alert: They are all super beautiful and worth it! The Algarve doesn’t do hiking like other places, which makes for some of the most impressive hiking you’ve done. Luckily—It’s pretty easy! I’ve done some of the hikes in flip flops but I would recommend not being like me and grabbing your hiking shoes or at least your running shoes. You can certainly twist an ankle if you’re not careful. 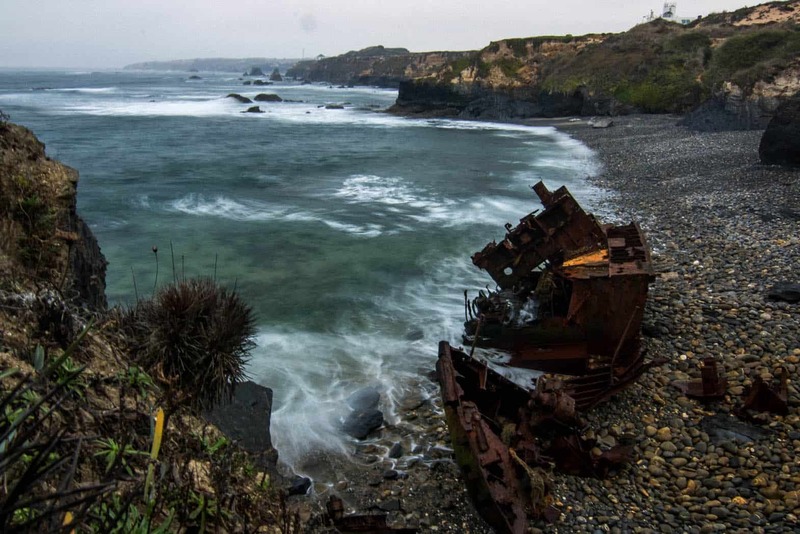 The dilapidated rocks that have taken over the craggy coastline make for a wonderful wander! High above the beach on the tops of those cliffs are barely marked and slimly trodden trails that you can meander for days—literally. The trails go on for what seems like forever and there are numerous trails scattered around the entire region. Most of them are along the coastline, and to be honest, they are the best ones! 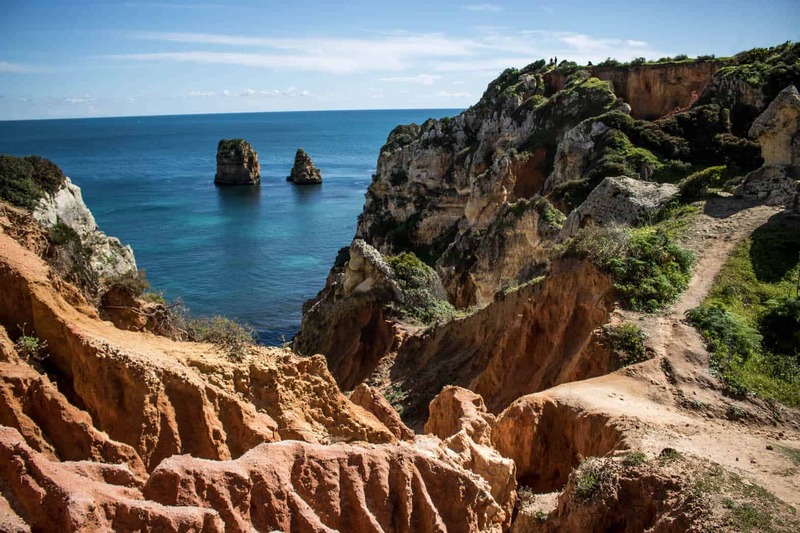 You have to hike around the cliffs on your Algarve itinerary—it’s crazy beautiful! 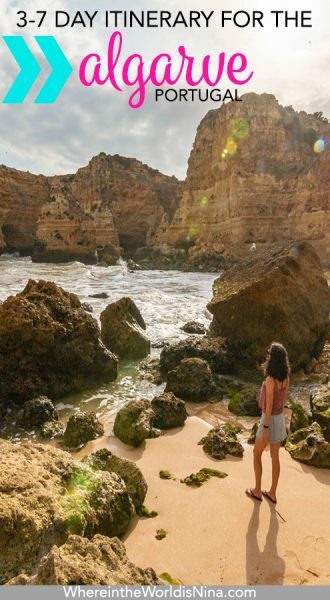 For miles and miles for as long as you want, you can explore hiking in the Algarve by the trails along the coast and when you’ve had enough, find your way down to a beach to cool off and get those toes into the sand. When I say you have to find the beaches, I’m being serious. Some of them are hidden in a cove or take monkey-like skills to get to while risking your life (half joking) hopping from rock to rock. Some will seem impossible to get to—because they are. Unless you have a boat! There were many beaches that evaded me during my days exploring the Algarve’s hiking trails. But that’s OK! I just went and scrambled to find the next one. I can’t tell you how incredible it is to hike along these cliffs and this by far the coolest thing to do in the Algarve in my opinion. The trails are all quite impressive but the top trails, in my opinion, are Telheiro Beach trails, Carrapateira trails, Seven Hanging Valleys, and the trails around Ponte de Piedade (the 4 blue marks). I’ve mentioned this before, and I’ll mention it again. The Algarve beaches are STUNNERS. I’ve really never seen beaches that are so dramatic and gorgeous. The soft golden sand, clear deep blue water, and sounds of the crests smashing onto the shores… It just doesn’t get old! 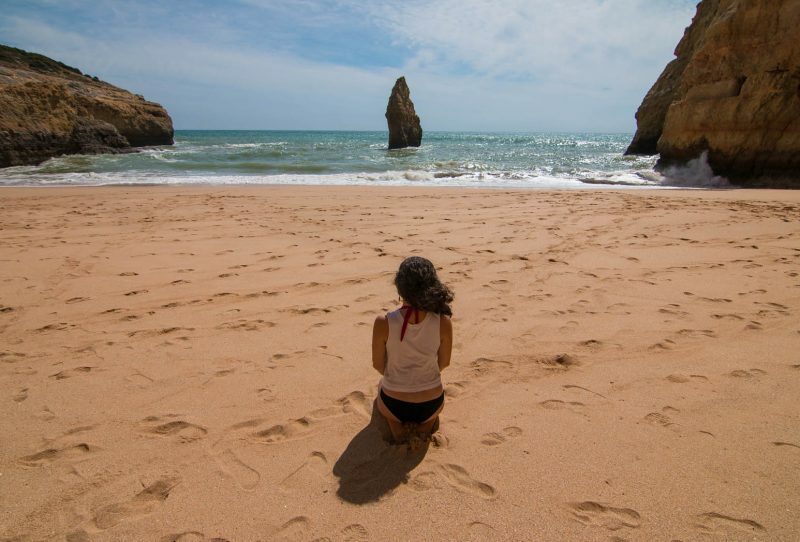 One of my fav things to do in the Algarve—Beach bum! The beaches here are almost all surrounded by incredible sunkissed sandy cliffs which is what makes these beaches so unique and jaw-droppingly beautiful. 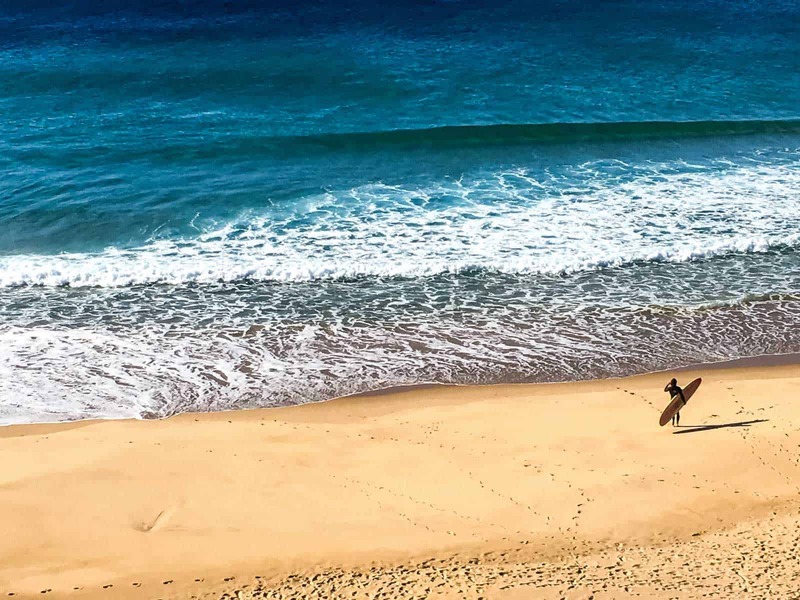 Some of my favorites are in the Vila do Bispo area but I have an entirely different post just on the Algarve’s most beautiful beaches that I absolutely love. Check that post out to see which beaches you’re interested in and which you can fit into your schedule. Don’t worry though, it’s hard to make a bad choice! It’s a religion I didn’t follow as much as I would have liked to. I know, I’m pretty disappointed in myself. Unfortunately (/fortunately) I enjoy visiting places during shoulder season and offseason. While surfing is still totally happening, it’s cold AF. At least in the summer you can peel your wetsuit off and bask in the warm embrace of the sun. During shoulder and offseason, the sun is out (as it almost always is in the Algarve) however, it’s not as warming as you’d want after surfing in some pretty icy water. The water is perpetually in “wetsuit needed mode” so definitely be prepared for that! But the good news is, if you’re here in summer, it’s going to be nice and toasty when you get out of the water. Aside from the cold water, I’m just simply not good enough. I learned to surf in Indonesia many years ago but that was nothing. I recently learned, again, to surf in Morocco though and this prepared me a bit more! However, Portugal’s waves are a bit more intimidating and I got ate alive. The waves are certainly more challenging in the area and despite my efforts, I barely got up and I’m not that bad! However, for anyone who surfs, this place is a haven either way. If you’re around Amado beach or in Sagres, check out the Algarve Surf School and bag yourself a few quick lessons before you tackle the Algarve surf solo. My friend works for them and they are a bunch of cool people who can prep you for surfing in the Algarve. Ponta da Piedade is a must on your Algarve itinerary. It’s GORGEOUS! If you only have 3 days in the Algarve, I’d suggest visiting Marinha Beach and the Seven Hanging Valleys trail in the area for a full day. The trails can take as long or a short as you want, same as the beach time! It’s a ridiculously gorgeous area, so chill and enjoy. If you can and if weather permits, throw in a tour to Benagil! It’s a uniquely beautiful cave beach which can only be accessed by water. You can kayak or boat to it. If the weather isn’t being nice and the water is too rough, the Seven Hanging Valleys trail you’re wandering around will take you to the top of it so you can peer inside. 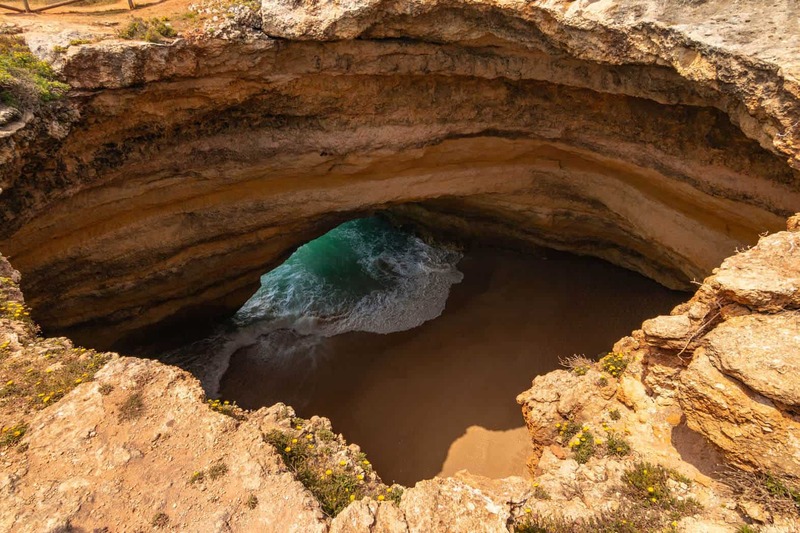 One of the most unique things to do in the Algarve—Going inside Benagil! For the next two days, I’d either grab a few surf lessons and see if you can be an overnight pro… Or, if surfing isn’t your thing, go for another coastal walk. Ponta da Piedade and the beaches and trails in this area are from another world. You can also walk around the nearby city of Lagos to get some shopping done or to admire the architecture. This will be a perfect mix of surfing, beach bumming, and hiking in the Algarve for your 3 days here! Have an extra few days? Sweet! I’d add in another surf day or two to your schedule. 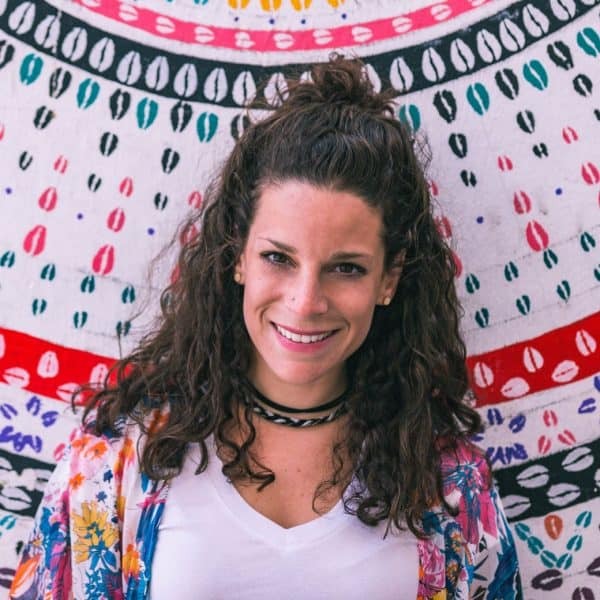 If you want to beach bum, check my beach post, you can literally fill your day with going to beaches and it would take you weeks to see them all! I’d also add the Telheiro and Carrapateira trails to your days while exploring the nearby beaches. If you’re curious to wander around a town, I’d recommend Lagos. 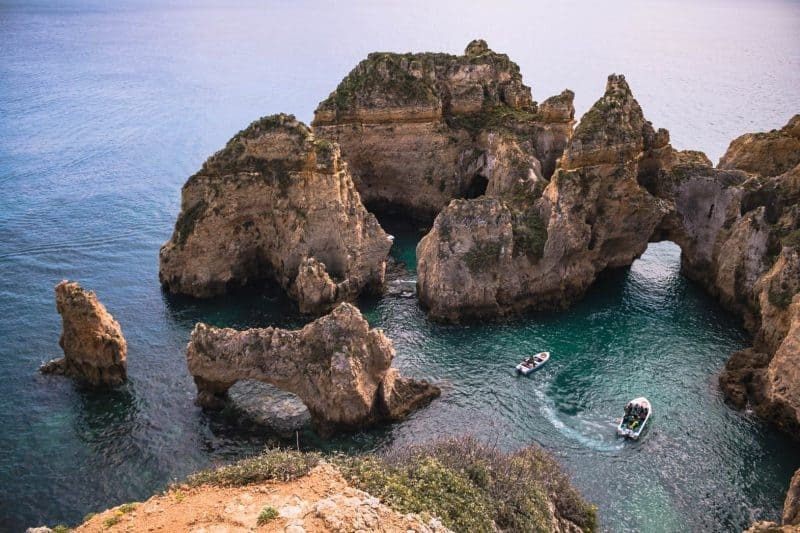 Portimao is almost too big and Sagres is almost too small, so for the “just right” town, in terms of most walkable, things to see, and nice, I’d say Lagos. Faro is OK, but a bit boring for my taste. Check out all the amazing and adventurous tours in the Algarve here! 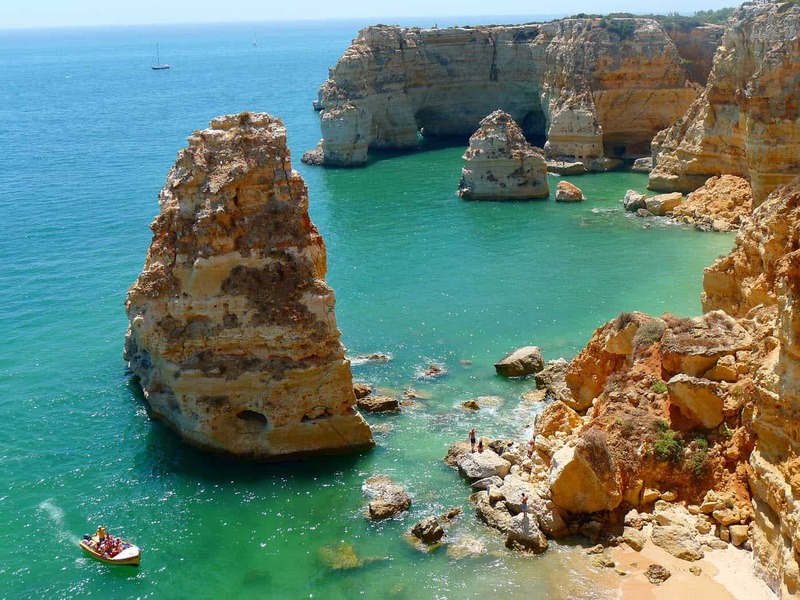 How Far Is Everything from Each Other on This Algarve Itinerary? This is the great thing about the Algarve. 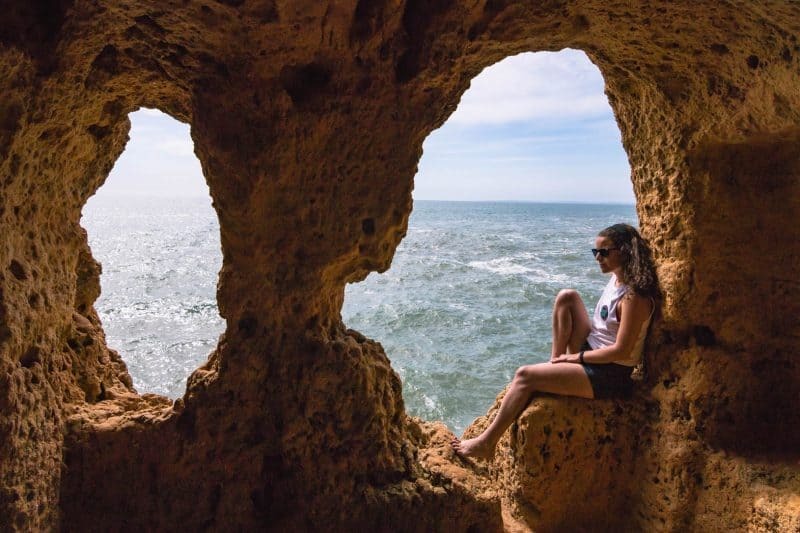 Whether you have 3 days or 7 days in the Algarve, everything is relatively close so you don’t need to panic that you won’t get to finish everything. …When you have your own car. This could be a plus or a total bummer depending when you get here and how you like to travel. The car hires in the Algarve get super cheap during shoulder and offseason. I’m talking less than $200 for a whole month cheap! But during high season, you’ll easily pay more than double. If you’re going with friends, the burden of the cost won’t burn too bad, but if you’re a couple or solo, it could hurt your pockets. The bad news about the Algarve is, it’s kind of difficult to get around without your own car. Sure there are buses that can take you from city to city but then you’ll need to hire private taxis or book tours to every attraction and sometimes, it’s not even possible. There are no tours at the trails, you’ll have to get a taxi there. Once you’re done, you’ll need to call one to get you as this isn’t New York City where you can just wave one down, plus some of these are a bit in the middle of nowhere. 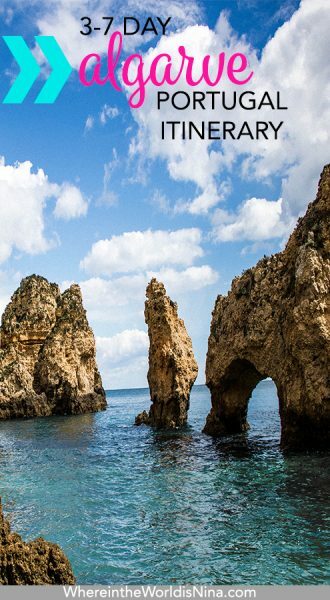 I think a car rental in the Algarve would be the smartest choice and the best way you’ll be able to get around on this Algarve itinerary. Without it, some of these spots might be a bit difficult or near impossible. If you want to surf, it’s essentially impossible to not have your own vehicle. How will you get to the beaches with your board? Some beaches have board rentals at them but you’d then need to rent daily as opposed to renting for a few days/a week at a time which is a cheaper option. The BIGGEST benefit to having your own car though is making it a better journey overall. There’s plenty of random beauty to stumble on and a road trip is the easiest and most epic way to see south Portugal’s paradise. These are just some points to think about when thinking about how to get around the Algarve. 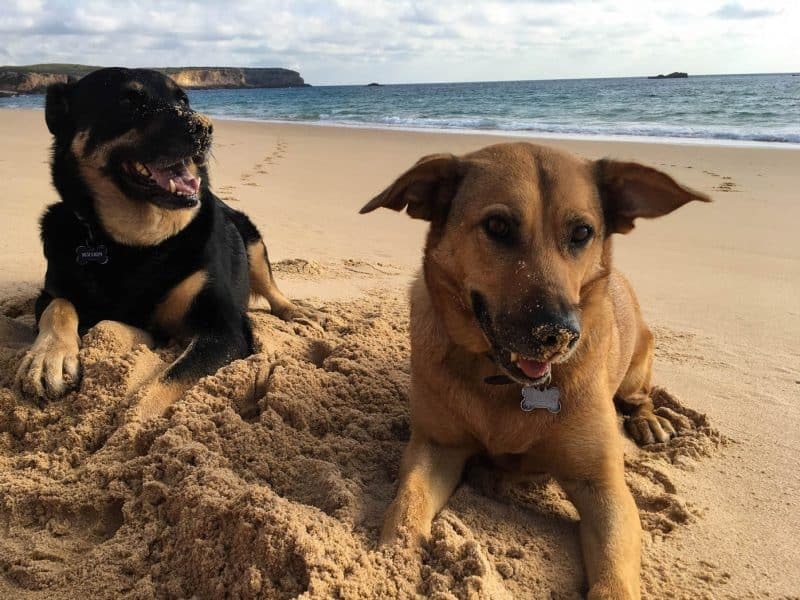 My fave Airbnb in the Algarve comes with these pups! Where Should I Stay During My Algarve Itinerary? Well, like we discussed, the attractions are all pretty close and if you have a car, you’re GOLDEN. If you want a livelier place, I’d probably say Lagos would be the next best place. Portimao is a bit too busy for me, so I wouldn’t want to stay there but maybe you would? Faro is another decent option if you need to be close to the airport. It might be a better option for those only staying for 3 days. Although it’s not the most exciting of cities. If you’re surfing, you need to stay as west as possible as that’s where the best surf is. Sagres is one of the best spots since there are so many surfing havens near it. The next option is Vila do Bispo but that’s even sleepier than Sagres (which is pretty damn sleepy). Overall, I’d recommend not moving around TOO much because again, you have a car, just drive to the spots (under an hour almost anywhere you want to go) rather than waste part of your day packing and unpacking and checking in and out of hotels. Not sure where to stay? I have you covered. Here’s where to stay in The Algarve. There’s info on 9 of the best towns and hotel recommendations for you too. 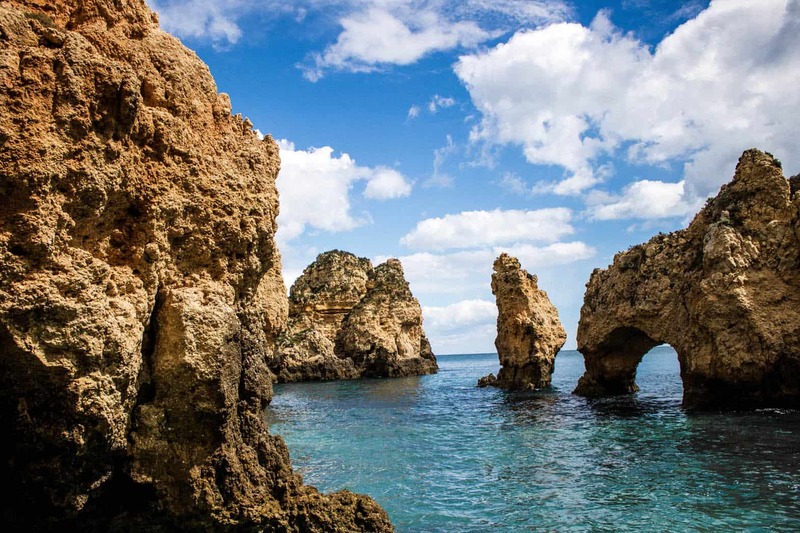 Your 7 days in the Algarve will consist of many amazing rock formations and archways! How to Get to The Algarve: Faro or Lisbon to the Algarve? The good thing about arriving in Faro is that you’re already in the Algarve! However, most would probably find the cheapest flights coming into Lisbon. Lisbon to the Algarve is about 3 hours driving to where the Algarve starts but if you’re going further south, it will take 4 hours or so. It really depends on what airport you’re coming into and where you’re going. 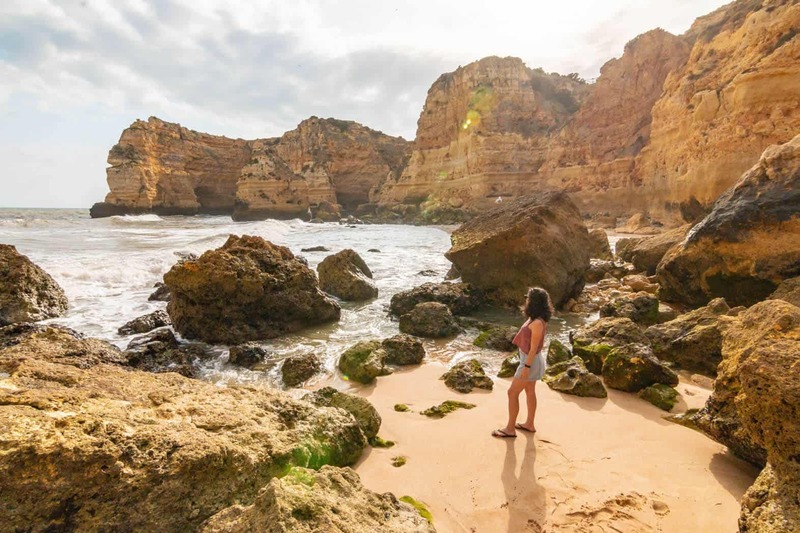 You could start your Algarve itinerary at the top of the Algarve and then work your way down towards Faro or start in Faro and work your way toward Lisbon. The only foreseeable issue is whether or not you want to pay the extra money to return your car to a different location. That would be something to look into. Otherwise, it would be best to backtrack with your car to return it to the same spot. Lisbon to the Algarve would probably be what is most comfortable for people visiting as it’s where most flights go. Keep in mind there are two ways to get from Lisbon to the Algarve: the coastal road or the toll road. Obviously, the toll road will be quicker but it also costs about 20€ one way. Get the toll pass with your car rental so everything is charged electronically. Is easier and faster. Double check that you don’t already get covered by car insurance from your travel insurance or your credit card! They are VERY good at guilt tripping you into getting crazy different insurance plans. If you’re covered, there’s no need to purchase more (We are covered by our credit card which is another reason why we get the car rentals in Portugal for so cheap). Always, no matter where you are in the world, take pictures and video of the vehicle before driving off. Point out every single tiny flaw. You could be covered for car rentals if you have Allianz travel insurance! It’s what I use when I travel. For car rentals, we had luck with AutoEurope and Holiday Autos for finding car rental deals! HIking, surfing, and beach bumming. It’s a simple list of activities to provide visitors with, but man is it impressive! You won’t get tired of the phenomenal views that the Algarve offers, it’s impossible! What are you adding to your Algarve itinerary? Which things to do in the Algarve are you most looking forward to? Let me know in the comments!